The Ottawa Indians Rugby Football Club was founded in 1962 after a split from the Ottawa Beavers. At the time the Beavers had to travel to Montreal and Toronto to play all of their games. This split was coordinated to increase the number of clubs playing in the Ottawa area. As such the Beavers and the Indians are Ottawa’s two oldest clubs. We still get along quite well off the pitch – but on the pitch is a different matter! The original Executive members of the club selected the club names to maintain a link with the native cultures of Canada and Canada’s historical origins. “Beavers” was chosen for its connection to the fur trade and the natives for whom the Europeans depended on for survival. “Ottawa Indians” was selected as the Ottawa Indians Tribe originally called the Ottawa River region their home., as the tribe traced their origins to the Ottawa River. We were Excited as well to learn of a Rugby Team named after our tribe. The Ottawa Tribe of Oklahoma has 2,000 members of which 500 live around Miami, Oklahoma. The Ottawa’s are a federally recognized tribe and sponsor’s an annual Pow-Wow every Labour Day weekend. The original home of the Ottawa (which means to trade or barter) was in the country watered by the Ottawa River. Harassed by their hereditary enemies, the Iroquois, they migrated westward to Lake Nipissing and gave it the name Kitchi Nipissing (the little big water). Here they formed a village and remained a considerable time; but becoming impressed with the idea that the place was haunted by a spirit which sought their destruction they, after a time, continued their migration further west to the north shore of Lake Huron and Manitoulin Island. Originally, the Ottawa Tribe was made up of five bands: the Kish-Ka-gon (the Bear Clan), the Sin-go (the Grey Squirrel Clan) the Ka-e-nou-che (the Peckerel or Fish Clan), the Na-sau-ke-ton (the Fork People) and Nigig (the Otter Clan). In 1615, the French explorer, Champlain, met three hundred men of the Ottawa Tribe which he named “Cheveux Releves” (raised hair) at some place between French River or Ottawa River and the Huron Villages that he was going to visit. These villages would probably have been on the eastern shore of the Georgian Bay. Manitoulin Island is referred to as “the Isle of the Ottawas”. Today, the only unceded land left in North America belongs to the Ottawas who have a reserve on the eastern end of the Island. By 1640, the Ottawas began to migrate into Wisconsin and Michigan. Establishing villages along the eastern shores of Lake Michigan (Cross Village, Little Traverse Bay, Grand River and St. Joseph). When the French Commander “Cadillac” built Ft. Pontchatrain at Detroit in 1701, he induced some of the Ottawas to take up residence there. Members of the Ottawa Tribe lived at Detroit until the close of the French Regime (1760). The title of the “Old Northwest” was passed to Great Britain. Actual possession of the country was not taken by Great Britain until 1765 because of the confederation Indian rebellion led by Chief Pontiac, the celebrated was leader of many of the western tribes. Pontiac’s rebellion of 1763 was successful against ten of thirteen important fortified posts. After the siege of the forts were raised, hostilities then ended November 1763. Pontiac and several Ottawa families left the Detroit area and established an encampment along the Maumee River in the present state of Ohio. These Two encampments grew into two villages, on the north banks of the river above the rapids of Roche de Bout. Pontiac’s villages were on Indianola Island and Vollmar’s Island on the Maumee River. Pontiac established another village along the Kankakee River in the Illinois country. Pontiac was assassinated by a Peoria Indian named Black Dog on April 20, 1769. With ever encroachment on Ottawa lands, the Ottawas were forced to move west of the Mississippi River into small reserve in what is now called Kansas. Both bands from Maumee and Augulaise river in Ohio and the Illinois band from Paw Grove in Illinois were removed to their new homes in Kansas between 1832 and 1839. In 1870, the Ottawas were removed once more into Indian Territory or Oklahoma. Many descendants of Pontiac live today in Oklahoma and around the United States and Canada. I am the Great, Great, Great, Great, Great, Grandson of Chief Pontiac. We belong to the Otter Clan. Many of us still speak our language and continue to research our history and maintain our heritage. We are very honored that you have chosen the Ottawa Indians to represent your Rugby team. We would be very proud to display your flag, pictures, patches etc in our museum. In 2018, after consultation with the Ottawa Tribe of Oklahoma and local Indigenous groups, the Board of Directors and the club membership recognized it was time to eliminate words which disparaged and disrespect the Indigenous Peoples. In an effort to honour the club’s history yet be more inclusive for the years ahead, the Board of Directors reviewed many suggested team names. One idea stood out – the Ottawa Ospreys. Just as the Ottawa Indians Tribe lived along the Ottawa River and its tributaries so many years ago, so do the mighty osprey today. The name seemed a natural fit. 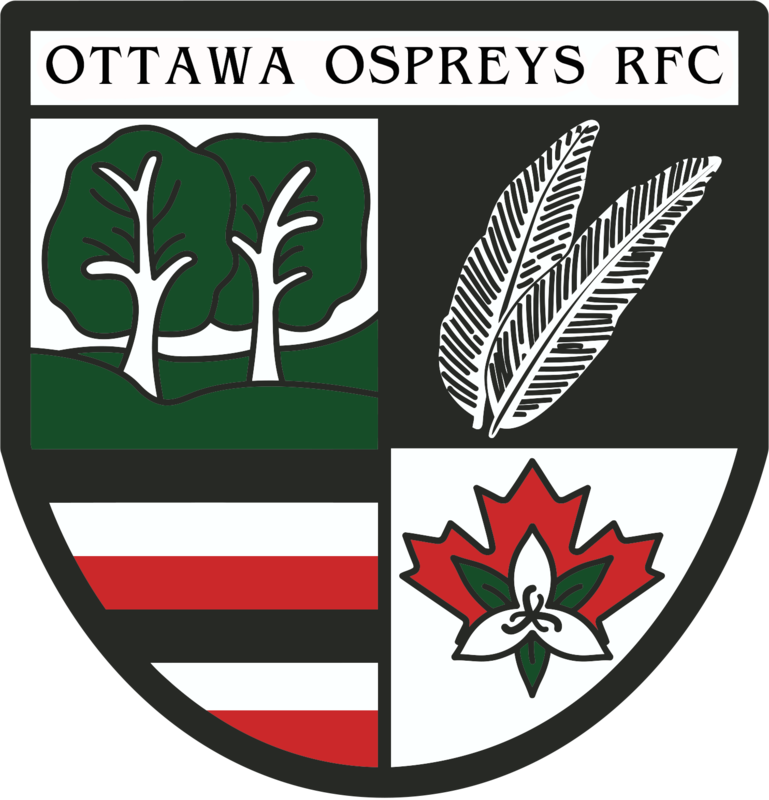 Effective March 2018, the Ottawa Indians Rugby Football Club began operating as the Ottawa Ospreys Rugby Football Club. The name change was a positive step forward, ensuring one of the core club values – inclusivity – was carried forward with the next generation of players. All rugby enthusiasts, new and veteran, are welcome to the club whether they are players, coaches, referees or just enjoy the game of rugby. Never miss a communication from the Ospreys!